I really love those new Visa World Cup Football TV and the Barclaycard Contactless Card commercials (see below). These ads depict using Visa and Barclaycard plastic to pay for small transaction amounts, such as using your credit card to pay for your lunch, and paying by card for a haircut. But these TV commercials representation does not quite match the reality on the ground in the UK, where many cardholders appear to be continually taken advantage of and are becoming frustrated by small merchants shops who either apply a surcharge, or insist on the minimum spend for payments by card. This reality is in direct conflict with Visa, MasterCard and Barclaycard's overall strategy, namely for card payments to replace all cash payments, hence the recent introduction of contactless payments in the UK. Contactless cards are not just designed for your convenience but to allow the card brands to soak up the small payment transaction space. 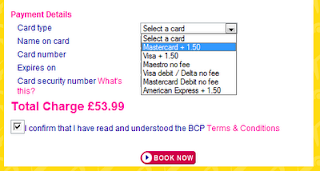 Can Merchants Apply a Minimum Spend or a Surcharge in the UK? I have been speaking with Visa, MasterCard and Barclaycard about this, and to be honest the answer is not clear cut as I thought it would be, mainly thanks to complicated European Laws and UK Laws, and even local area laws comes into the equation. What I do know is the likes of Visa and MasterCard do have strict regulations which they say apply to all merchants (retail shops) which accept their card payments. These regulations clearly state merchants are not allowed to apply any surcharge or require a minimum spend amount as detailed below. • Add any surcharges to Transactions, unless local law expressly requires that a Merchant be permitted to impose a surcharge. However these regulations are trumped by law, EU, UK and even local laws. For example airlines, holiday companies and large concert ticket providers cite legalise to get around these regulations, applying surcharges to their card payments. Sometimes they hide the surcharge as an administration fee, which is fine for a business which don’t offer a cash payment alternative. I thought this could be a key point, as small shops obviously are accepting cash payments along side card payments. I have been reading up on the legal side of this issue, as I understand it, it appears merchants are not allowed to profit from surcharging. However going back to the strict card scheme regulations, lets take the scenario where we have a small shop which has been provided with the equipment to accept card payments, as provided by the likes of HSBC and Streamline. From my conversations it came across surcharging and applying a minimum spend in this type of scenario is highly frowned upon by the card schemes (Visa & MasterCard). In fact during my discussions with these card brands, they both offered a method to file a complaint about small merchants doing this. Visa: Notify your Visa card-issuing bank. Visa Member financial institutions have access to the appropriate Visa rules and regulations. Your card-issuing bank can best answer your questions about surcharges. They also have access to the Notification of Customer Complaint forms that should be used by the financial institution to document and file this type of complaint. You can contact them directly, using the address or telephone number on your Visa statement or on the back of your card. MasterCard: File a merchant violation by Email consumer_advocate@mastercard.com . We do contact the merchant's bank when we see repeated violations and they are requested to maintain appropriate controls over the merchants. Now my legal eagle brother likes to point out shops can always refuse your card payment transaction and kick you out of their premises without providing any reason, true. However I argue that most small merchants sign an agreement to abide by these regulations as part of the package in being provided with the means to accept the card payments. 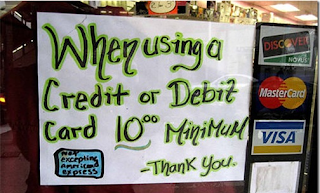 Therefore it seems pretty clear to me most smaller merchants are not permitted to surcharge or require a minimum spend at all. Banks which provide the payment devices have the power to disable the payment devices from any merchant which doesn't comply, so would act if a card scheme or customers highlighted a merchant wasn't complying with these regulations. So after doing further digging on the legal side, it appears merchants are indeed allowed to make charges under law, remember the card schemes state law trumps their regulations, however I found another angle on legal side, in that merchants need to clearly advertise their surcharges. Since the 28th February 1991, in accordance with the Credit Cards (Price Discrimination) Order 1990, retailers have been allowed to apply these charges to the cardholder. It may help you to know that customers are protected under the Consumer Protection Act 1987, which states that is a criminal offence to mislead the customer regarding the cost/charges of a purchase. Retailers are therefore required to clearly advertise and advise their intentions to the customer before applying this charge. My conclusion on minimum spending and surcharges; because of the legal situation, unfortunately I cannot state UK merchants are not allowed to add surcharges or require customers make a minimum spend for payment card transactions. But if you feel strongly about this you can raise a complaint against any merchant indulging with these practices with the card schemes and acquiring banks, namely the providers of payment equipment e.g. Streamline, HSBC. I will continue to research this situation, I am very interested if anyone else has any further information or views on this one. Now I do feel the merchant’s pain in that the cost (transaction charge imposed on them) in taking small transactions really hits their profit margins, but hey this is the price of having the ability to accept card payments at your business, no one is forces any business to offer the acceptance of card payments. Here’s the thing that really bugs me about this. There are too many merchants in the UK which are running a muck with these charges, some are ignorant of these requirements, and some are actually sticking two fingers up at the regulations they sign up to, I know because shop owners get very nervous when I ask question their surcharging. So what do you think merchants are doing about the Payment Card Security regulations, specifically Payment Card Industry Data Security Standard (PCI DSS)? The next time you have fraudulent transactions on your credit card and don’t understand how your card details were stolen. Know it is more than likely than not, that your details were stolen from a merchant which held your card details, because the merchant was not following card security regulations and adequately protecting your card details while in their care. By the way merchants certainly cannot hide behind law when comes to their compliance with card payment security regulations, and specifically PCI DSS compliance. It is worth noting that we do not have any breach disclosure laws in the UK, it is never in the interest of merchants, banks and card brands to publicly disclosure payment card breaches. But I can tell you card payment breaches of UK cards in significant numbers are occurring due to UK merchant security negligence, it's happening behind closed doors, and it's happening far too often. I run a pub/restaurant and it is just not practical to accept payment for a single drink or packet of crisps on a card - the commission fees charged by the card companies make it completely prohibitive - perhaps this should also be addressed. Very interesting article. I think that if the contract between merchant and card payment entity states that surcharges or minimum purchases cannot be applied, then there is the answer. I think that everyone should be aware of this type of agreement to be able to refuse to pay extra costs when purchasing. I don't believe it's fair consumers have to pay a fee as the merchant will claim the charges back at the end of the tax year. So they are profiting on the transaction fee. As a small business I have to agree with Jill the charges occurred for us per transaction means we are in a loss, I personally make a loss on anything under £3.50 I ask customers have a minimum spend of £5 which I don't think is unfair and nor do my customers, they requested I offered card payments for their ease. If Mastercard or Visa wish the consumer on the street to be about to pay for things such as their adverts, they should look into cutting the charges. This is just an artificial limitation set by the banks... in reality these transactions cost virtually nothing. I hope this issue is addressed in the near future... for the time being though the banks are still monopolising chip and pin transactions. why should a cash paying customer have to subsidse those morons who pay for a £1 item with a card AND also hold up everyone else in the queue while the machine chugs away... have to put up with such stupid cash management behaviour. I cant believe nobody actually realises why they do this lol. Its simple really, the reason they are taking the piss with minimum charges is because they are trying to demotivate you by paying by card, so that when you pay by cash, the additions can dissapear from there tax compilations. Simple, they can show less tax if its cash, theres no proof. Simples. The card companies need to fix this. Their big agenda is to move us to a cashless society and the rise of contactless is their next big move. Contactless is meant to eradicate the need for pennies so if retailers are demanding minimum spends then it's counter to the card company agenda. Do you know if legislation has moved on since you first wrote the post? Very interesting, I just tried to buy a loaf from my local Waterfield's bakery and was refused as my purchase was under three pounds. Apparently this is a mandate from head office and there are numerous signs in the shop which clearly state this. Someone in their accounts department clearly has a point to make and I am guessing they don't really know why. Unfortunately living in the country means I may be out all day and not see an ATM so I am one of the 'Morons' that pays with a card! Usually quicker than the brain dead searching in their pockets for loose change or offering a £20 note for a £1 purchase. Meanwhile I have swiped and gone! But I do object when I enter a pub and order drinks for myself and Wife, then when I present my debit card (contactless enabled) to be told minimum charge £10!...wtf...OK no problem just give me the change...sorry sir can't do that...OK bye....pour those drinks down the sink as I am not paying £4.50 surcharge. I'm sorry it is simply down to this if us as a retailer are being charged 50p per card transaction and you the customer are only spending £1 by the time we have paid for the product,staff,rent,rates etc etc we would be out of pocket no profit no business simples !!!!!! I went to the Mandarin House in Earls Barton, Northants and was alarmed that they have a minimum Credit Card spend of £14. As my takeaway meal only came to £8.70 and I had only £7.50 cash I could not purchase! Is this legal? It seems to me that if you are a customer you resent minimum spends and surcharges, but if you are a retailer you generally need them. The level you require depends on what your provider charges you as a retailer, including the additional rental fee for a contactless terminal. It is also clear that some retailers really overegg these charges just as some mark up goods excessively. However, as a rural retailer, I can say that contactless is not always quick and can slow a queue up, just as a customer fiddling arpund with change and not being ready to pay when they reach the till can do so. As long as the retailer displays the fact that there is a minimum spend or surcharge then you as a customer can factor that in to your decision to purchase or not, or go elsewhere if you choose. Or perhaps even say thank you to the retailer for being open and providing the articles or service you enjoy. Many businesses rely on cash to pay some or all of their suppliers and prefer cash instead of having to wait the few days to have their accounts credited by the card payment provider. Until the regulations and law changes accept the different perspectives of those involved and vote with your feet if you feel hard done by.